Call 'em freakbikes, choppers, funnybikes, clownbikes, kustoms, tallbikes, swingbikes, lead sleds, chunkbikes, trashbikes, frankenbikes, or whatever you like, this is a record of human-powered creativity in Chicago. In choosing which bikes to feature on this site, I've tended to shy away from kustoms and lowriders. The reason is straightforward- there is a large, existing structure of support and publication for those communities. My central goal with these pages is to record creativity that's going on out there in small pockets in garages and basements, whereas hobbyists with the skill to create professional-looking kustom bicycles are either photographing their bikes for themselves or publishing pictures of them in various kustom magazines. They have swap meets, specialized bike shops, and shows. I admire their craft so long as the bikes are made to be ridden. However, the materials and tools involved represent somewhat of an economic high ground, and it is much more fascinating to me what can be done for little or no money. In a similar vein, this page is not at all about the Rat Patrol, a prominent chopper gang of which I am a member. While I invite everyone I photograph to our rides, the Rat Patrol doesn't need me to promote it. So I will feature individual bikes on this site that are Rat bikes, and I always record Rat Rides, but I am in no way speaking on behalf of the Rat Patrol. 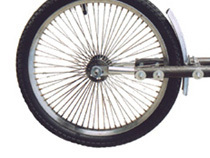 Rat Bikes are indicated by the icon. I've heard rumors of a few other chopper gangs out there, and there are definitely lowrider and beach cruiser clubs, so perhaps I need a section featuring organizations as well. In an urban environment there are cars and bikes. Riding everyday in the city is a game of cat and mouse. The huge bulky cars that purr as they hunt the nimble bicycle mouse. The mice are often caught in the shiny chrome teeth of the front grill of the car. The mice are dumb, they know their way to work and back and that is all. The only way to take back the streets from the Cats is for the mice to call upon their rodent brethren. Not other mice who are soft and dumb from running in wheels all day, back and forth to work, no, they must call upon the Rats. The sinewy, dirty, sweaty chopper riders. They don't set foot in bike shops. They scrounge the garbage and build their vehicles from people's refuse. They know the secrets of the City's alleys. They know Her intimate places. They know how to start the Velorution, for it has already begun.